June 28 - Saint Irenaeus, Bishop and Martyr - Memorial - My Catholic Life! The iconic opening words of Julius Caesar’s Gallic War are “All Gaul is divided into three parts.” The chieftains of these three regions of Roman Gaul (France) met yearly in the southern city of Lugdunum, known today as Lyon. These rough noblemen and their large retinues trekked to Lyon in 12 B.C. for the dedication of the Sanctuary of the Three Gauls on the slope of Lyon’s hill of the Croix Rousse. The inauguration ceremony was an elaborate reinforcement of Rome’s military, religious, and commercial dominance. Pagan priests performed pagan rites on pagan altars to pagan gods, asking those gods to favor the new sanctuary, the tribes present, and the city. This important sanctuary remained a focal point of Lyon’s civic and religious life for centuries. And in the sand and dirt of this Sanctuary of the Three Gauls, in 177 A.D., the blood of the first Christian martyrs of Gaul was spilled. Here they were abused, tortured, and executed. Killed for their faith were about fifty Christians, including the bishop of Lyon, Pothinus, and a slave woman named Blandine. While they were imprisoned and awaiting their fate, these future martyrs wrote a letter to the Pope and gave it to a priest of Lyon to carry to Rome. That priest was today’s saint, Irenaeus. With the dead bishop’s mutilated remains tossed into the river, Irenaeus was chosen as his replacement. He would remain the bishop of Lyon until his death. It was in this way that the tragic end of some lifted up others. As the first generation of Christians in Gaul retreated from history, the great Saint Irenaeus, the most important theologian of the late second century, emerged. Copies of Saint Irenaeus’ most important works survived through the ages, likely due to their fame and importance, and are now irreplaceable texts for understanding the mind of an early Church thinker on a number of matters. 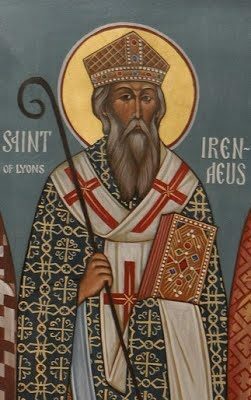 Irenaeus was from Asia Minor and a disciple of Saint Polycarp, a martyr-bishop of Smyrna, who was himself a disciple of Saint John the Evangelist. The voice of Saint Irenaeus is, then, the very last, remote echo of the age of the Apostles. Similar to those of Saint Justin Martyr, Irenaeus’ writings astonish in proving just how early the Church developed a fully Catholic theology. He promoted apostolic authority as the only true guide to the correct interpretation of Scripture and, in a classic statement of theology, Irenaeus explicitly cited the bishop of Rome as the primary example of unbroken Church authority. Like Saint Cyprian fifty years after him, Irenaeus described the Church as the mother of all Christians: “…one must cling to the Church, be brought up within her womb and feed there on the Lord’s Scripture.” This theology notes a beautiful paradox. While in the physical order a child leaves his mother’s womb and grows ever more apart from her as he matures, the Church’s motherhood exercises an opposite pull on her children. Once she gives us new life through baptism, our bonds with Mother Church grow ever stronger and tighter as we mature. We become more dependent on her sacraments, more intimate with her life and knowledge, as we grow into adulthood. The Church becomes more our mother, not less, as we age. On Pope Saint John Paul II’s third pastoral visit to France, in October 1986, his very first stop was the Sanctuary of the Three Gauls in Lyon. Excavated and opened to the public in the mid twentieth century, it rests largely unknown, a ruin, in a residential neighborhood. Before dignitaries and a large crowd, the Pope prostrated himself and kissed the site where the martyrs of Lyon died so many centuries before. Saint Irenaeus may have been looking on from the stone benches that fateful day in 177 A.D., and observing from heaven in 1986. The blood of those forgotten martyrs watered the seed that flowered into the great saint we commemorate today. Saint Irenaeus, may your intercession strengthen our wills, enlighten our minds, and deepen our trust. Like you, we want to be loyal sons and daughters of God, and loyal, educated, and faithful members of His Church. Help us to fulfill our loftiest and our most noble goals. THIS Saint was born about the year 120. He was a Grecian, probably a native of Lesser Asia. His parents, who were Christians, placed him under the care of the great St. Polycarp, Bishop of Smyrna. It was in so holy a school that he learned that sacred science which rendered him afterward a great ornament of the Church and the terror of her enemies. St. Polycarp cultivated his rising genius, and formed his mind to piety by precepts and example; and the zealous scholar was careful to reap all the advantages which were offered him by the happiness of such a master. Such was his veneration for his tutor’s sanctity that he observed every action and whatever be saw in that holy man, the better to copy his example and learn his spirit. He listened to his instructions with an insatiable ardor, and so deeply did he engrave them on his heart that the impressions remained most lively even to his old age. In order to confute the heresies of his age, this father made himself acquainted with the most absurd conceits of their philosophers, by which means he was qualified to trace up every error to its sources and set it in its full light. St. Polycarp sent St. Irenæus into Gaul, in company with some priest; he was himself ordained priest of the Church of Lyons by St. Pothinus. St. Pothinus having glorified God by his happy death, in the year 177, our Saint was chosen the second Bishop of Lyons. By his preaching, he in a short time converted almost that whole country to the Faith. He wrote several works against heresy, and at last, with many others, suffered martyrdom about the year 202, under the Emperor Severus, at Lyons. Reflection.—Fathers and mothers, and heads of families, spiritual and temporal, should bear in mind that inferiors “will not be corrected by words” alone, but that example is likewise needful.